I had mentioned my collections the other day and promised to share them with you. Well, I'm having to dismantle my displays and bring them into an area by a window so I can get enough light to take at least halfway decent pictures. 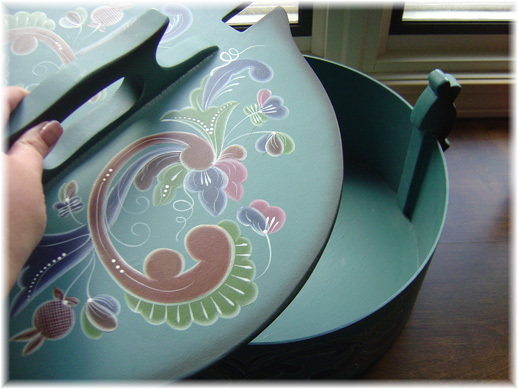 This little collection of rosemaling has a few different styles, but the most wonderful thing about it is everything except the large svepask was owned by either my mother or grandmother. I love things that are a bit more personal. My mother's tine was the first that I acquired. It's actually not quite a tine, based on construction, but the intent and use is the same. In my house, my kitchen was perfect for going Scandinavian instead of the French Country I had had in my last house. When I told my mother my idea, she sent me some hand-crocheted Scandinavian valances that she wasn't using and her tine among other things. I use this tine in my kitchen to hold little things just like my mother used to, so it's not a part of the display normally. When my mother told my Amma (grandmother in Icelandic) my plans, she bought me a gorgeous tine in Norway on her next trip there. 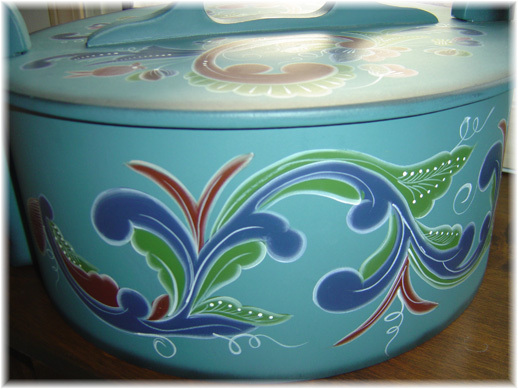 She brought it along with a collection of rosemaling items from her home the next time she visited from Iceland. 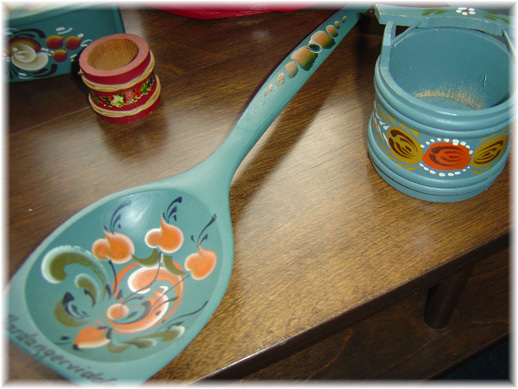 The tine opens by slightly pulling the handles back and lifting the lid. Smaller ones used to be used to take lunches to the fields or work, and they were also used by women to hold their treasures: jewelry, gloves, and items that were part of the national costume. 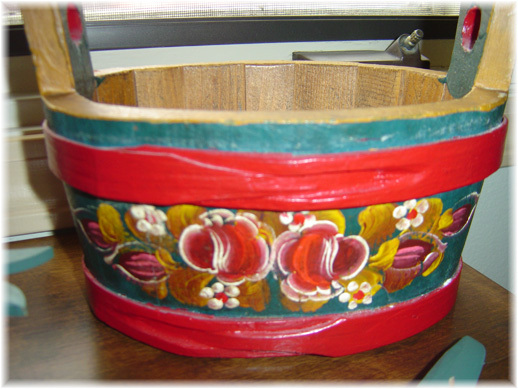 They are bentwood boxes and called tine (pronounced tina) in Norway and svepask in Sweden. I also have a much smaller tine that used to be in my Amma's home. Here are a few other item's from her home, the spoon always hung on the wall, but I have chosen to display it with the rest of the items. Last but not least, I keep this by my fireplace. No, not the Nisse, the fireplace bellows. This is another present brought back for me from Norway by my Amma. 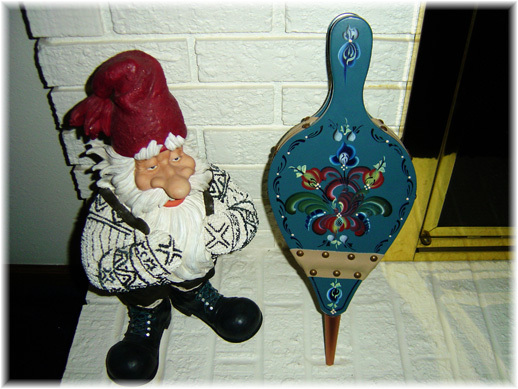 I'm not an expert on the various styles of rosemaling, so if you are interested in knowing more about the various styles the Illinois Norsk Rosemaler's Association has a great page with pictures and explanations. These are gorgeous pieces- thanks for the lesson! How nice for you to have some family pieces.